When was the peak for the potential of high fidelity audio systems in the home? As audio systems have steadily improved, the amount of noise in the powerlines and even in the air has increased with it. From a noise point of view, the era before switched mode power supplies and mobile telephony, not to mention the internet and the Wi-Fi that came with it should have made life a doddle for audio equipment. In the 1980s, there was far less radio frequency interference (RFI) and lower levels of electromagnetic interference (EMI); go back further and such things would have been lower still, before microwave ovens for instance. Maybe that’s why music recorded in the sixties and early seventies sounds so good, but it was also the time that analogue studios peaked before digital came along and gave them so much power to screw things up. Analogue audio systems were reasonably advanced by the 1970s, but digital had only just begun to encroach beyond the lab, and the story of digital audio goes hand in hand with the expansion of noise-emitting devices in the world at large. Now we are at the point where it’s possible to improve a system merely by improving earthing, so it’s no wonder that the demand for mains cleaning devices has grown. IsoTek has been making nicely encased mains filters and regenerators for some time now and they identify two key sources of interference: differential mode and common mode. Differential mode is the noise that’s on the mains supply and created by other electrical devices such as computers, TVs, etc., as well as the components in your sound system. Common mode noise is mainly at radio frequencies, from things like your Wi-Fi, mobile phone, TV, and radio transmissions. It too gets into the mains supply because power cables act like an aerial. And then there are homeplugs, which carry your network through the mains wiring – arguably the best way to pollute your power supply yet devised by man. IsoTek’s latest creation is the EVO3 Nova One, a single outlet power filter in a very long but small section case that’s designed for source components and other low current devices such as preamplifiers. The company describes this as an evolution from the original GII Nova with a modified and improved clean power network created specifically for source components that use less power. It’s designed to deliver high-frequency filtering, and has a nine section circuit consisting of both series and parallel filters to remove both common mode and differential mode noise on the mains. The other single outlet source specific conditioner in the Mosaic range is the EVO3 Genesis One. They call this a single-cell sine wave generations system; in other words, it isn’t a conditioner in the usual sense that it filters our noise, but rather a regenerator that that creates a precise 50Hz, 230v signal regardless of what’s coming out of the wall. You can get the Genesis One with or without a display that tells you how many volts it’s receiving and how much it’s outputting in terms of Watts, THD, and voltage. It’s quite surprising how much variation there is in terms of voltage from the mains, mine rarely goes down to 230v but usually hovers somewhere above it. 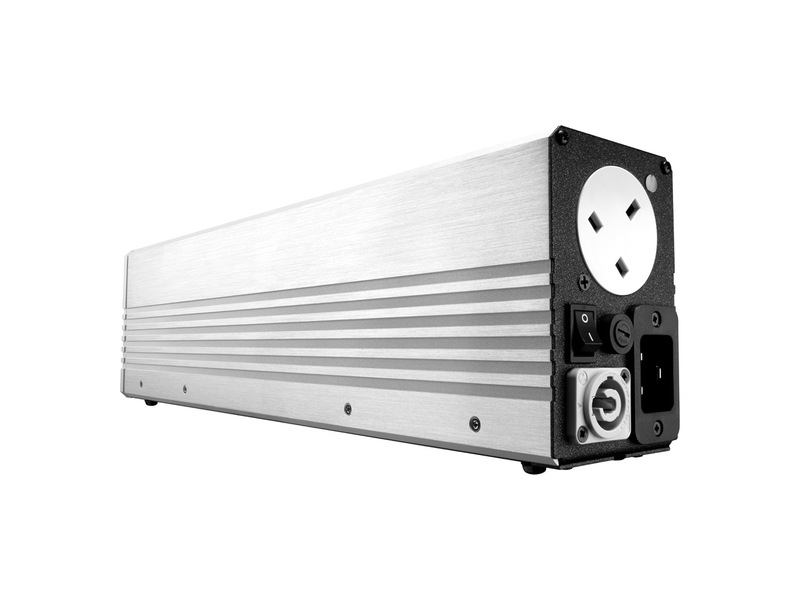 It produces the desired voltage with a Class D amplifier with linear power supply and all internal connections are made with silver plated PC-OCC in a virtual air dielectric cable that you would be happy to have in pretty well any component. The Genesis One is specified to deliver up to 100 Watts and thus can power anything that isn’t an amplifier.